More of the new S/mileage! After School’s UEE meets AKB’s Kojiharu! Matenrou Opera comes to America! And so much more! AKB release their lost stages! Tragedy for Taji of X Japan! Another Scandal clip from AM2! Bikkuri Project offers another maddeningly difficult H!P challenge! And so much more! DiVA preview their second single! Kikkawa Yuu announces a new song! Yamaguchi Momoe retires from the idol world at the tender age of 21! Wait, what was that last one? Well, find out at the link! A new album from Hamasaki Ayumi! After School divides into the red and blue! Charmy and Chisato wear policewoman blues! An ex-AKB places in a beauty pageant! Sandara Park measures herself! And so much more! 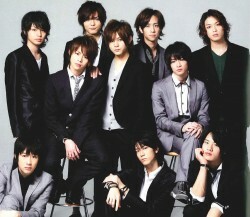 Johnny’s makes its official statement on the HSJ smoking scandal! Selective Hearing reviews the SNSD album! GD&TOP release an old music video! Ohno deals with luchadore and red-hot chicken! And so much more!